Does this not depend on how we interpret the word “god”. For Christians it usually means “the creator” or “he who has made all things” but my impression from my (very limited) knowledge of Buddhist texts is more that “devas” are simply beings who were reborn into a high realm of existence but like all unrealised beings they are subject to kamma and therefore to the cycle of birth and death. Yes, for Buddhism the gods are simply beings who have long and pleasant lives. But that’s the point, really; the Buddha undermined the notion of a creator God (which is what Brahma was) and demoted him to the status of being just another deluded mortal. Yes, I agree with you on the first para. People have misconception on deva & brahma & do not understand they are morals too & even they face the suffering. Buddhism has taken on different forms in every one of the cultures you’ve mentioned, and Buddhism will look different in the West, too. Fortunately no one is making you change what you do and believe. You, as a Buddhist, may believe in the existence of gods and their capability to help others. But I, as a Buddhist, don’t. Presumably you can accept that my beliefs don’t interfere with your ability to hold your own beliefs, so as far as I’m concerned there isn’t really an issue worth discussing. I appreciate your equanimity, Ananda. Views are very varied in both the US and Europe (where I am originally from). Some people adopt traditional views wholesale, including a belief in devas, etc., while others adopt a more skeptical approach. Perhaps, Ananda, you might think of the Buddha’s teachings as a practice. Religions are quick to tell us to do good and avoid bad, but they offer little training and help on how to do this. 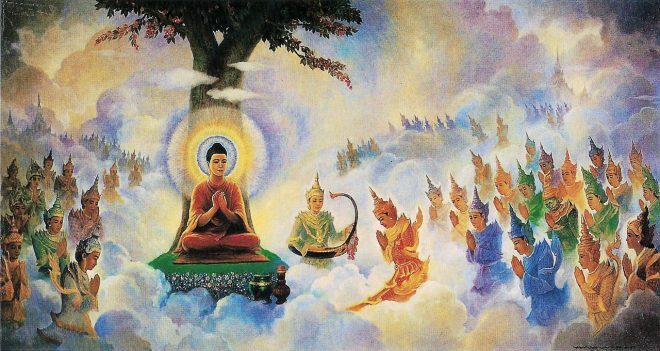 So Buddhism often goes hand-in-hand with the prevailing religion, with the different religions of the different countries in which it is found. In Japan, it goes along with Shinto, while in Tibet it goes along with Bon. Many Irish Buddhists (I am Irish) are Christians. So it is not surprising that many countries have Buddhist traditions that believe in gods. But these gods are not Buddhist gods, they are the local deities. And what makes a Buddhist practitioner is not what they believe but what they do; so long as we share this practice, we are part of a sangha together. Our beliefs may be as different as our clothes or our customs, but hopefully our actions are guided by the same wisdom. Please, I’m very curious: Do you follow the five precepts ? Thanks. I discuss that sutta in this post. Indeed. I make reference to that sutta in this post. Here one sutta which similarly follow the same story. Also link in tipitaka is given below. Note: What all exist means? After knowing , whether im exist or you exist or god exist or nibbana exist is unconditional. Similarly, if i get to know, I’m not exist, nothing to do with it. Only thing it is fake because exactly same story is not in tipitaka. So the Buddha’s essentially saying that there’s a kind of sphere of experience that each of us lives in, and that there’s nothing we can sensibly talk about that lies outside of that sphere. Janussoni’s question is whether this “All” exists or does not exist, and as always the Buddha points out that the terms “existing” and “not-existing” are extremes that don’t match with the reality of how things are, which are that they are ever-changing and essenceless. Sir, superb explanation… thanks a lot..
Let me come to the straight point. Actually your reply gives the answer to “all” . Sir, do you think you are exist in this world? Sir you could say “YES” to the questions. This is one extreme. But actually you are not exist. This is second extreme. the things and the persons the names refer to do not really exist. Ven Nagasena answered, “My companions call me Nagasena. your chariot? Is the horse the chariot? Is the wheel the chariot? The King answered “No” to all these question. The King again said “No”. *//sir, me,you, god, demans, Nibbana, buddha, nagasena are exists in one extreme. Also there are many unanswered question in tipitaka, not only suttas on “all”. sir you can say it is fake because it is not in tipitaka. But It never break any precepts. Why do u mix conventional & ultimate truth in that story by ur imagination? In conventional level ground budha break truth precept(as in that story) that shows inconsistency that concludes that is created fake story by others..
“Does God exist?” created story doesn’t matches Lord BUDDHA teaching. That story breaks truth precept. Sometimes in teaching we’ll dramatize a story from the scriptures in order to make it more interesting and relevant to our audience. I think we have certain ethical responsibilities when we do this: for example the words we put in the Buddha’s mouth will not be exactly those in the scriptures, but we shouldn’t be making the Buddha say things that depart from his teachings, as happens in the example above. So yes, the “Does God exist?” story is untruthful, because it misrepresents what the Buddha taught and how he conducted himself. Sir, very wise conclusion. Thank you for created this web. You are a protector of buddha dhamma. May you attain all 3 kinds of happiness! Bodhipaksa, he is a Hindu in a mask of Christian. I know him. It is the natural habit of Hindus to lie on Public Platform. They want to degrade Christianity and Islam by falsely uniting Buddhism, Jainism and Hinduism (in their brainwashed minds). So it is better that you should be aware of such people in your comment section. Hinduism is nothing but slavery of lower castes. Don’t give enough importance to such people. Thanks for understanding and writing this article. I don’t know if this is correct, but a long time ago I heard or read that when Ananda asked the Buddha if God existed, the Buddha basically didn’t give a yes or no but pointed out that it was stupid to be obsessed with this ponderance when you can’t even figure out how to get on with your neighbour, be equanimous, etc. When you become enlightened, then you’ll know. But you won’t become enlightened by being opinionated. People with opinions just go around annoying one another. Any clues? That’s pretty close. He did say that speculating about the origins of the world was pointless (worse, it would bring madness and vexation). Elsewhere he said that similar speculations were simply a distraction from our focus on Dharma practice leading to awakening. Gods, however, feature as characters in the suttas. Sometimes the Buddha recounts conversations with them. I take these as being intended ironically. In one sutta he talks about how Brahma is deluded in thinking that he created the world. The Buddha’s version is that Brahma happened to be the first god to be “reborn,” and was just thinking about how cool it would be to have some company when the other gods started popping back into existence. Brahma, being a bit of an egotist, assumed that his thought had created the other gods. So the Buddha doesn’t seem to have denied the existence of gods, but he did say that speculating about them (and especially about whether they created the world) was a waste of time and effort, and he also used a rather humorous lampoon (or several) in order to make Brahma look a bit foolish. This is assuming that the Buddha said any of this stuff. All we know is that the scriptures say these are the words of the Buddha. haven’t actually read much on the buddhist take, apart from the general precept position. I checked out your website and will delve in more. It looks quite interesting.Also watched your Tedtalk, which was also enlightening. I’m in Fremantle, Western Australia. If you know anyone from your group around this neck of the woods, let me know. The story I heard for the first time. As we study Theravada Buddhism in Sri Lanka, we have not learnt this study. I think it comes from Mahayana Busshism. Over the centuries pure Buddhism has been spoiled by adding HIndu veda concepts & Mahayana concepts. In Buddhism, it is explained there are gods & brahmas; but they are powerless. There is no creator or one powerful god. Samma Sambudhdha said ‘Humanity’is great & to attain humanity it is much more difficult. HUmanity is great because only humans can attain nibbana but not even Gods or Brahmas. Gods, Brahma, thirisan ( animals) & beings in the hell ( niraya) are in 2 extreme ends where humanity is in the middle. Beings in the extreme ends cannot understand the other sides; but beings in the middle i.e. humans can see both ends. That’s why only humans can realize nibbana. All these 3 sides / worlds are suffering or facing ‘dukkha sathya”. That is the reality. Samma sambudhdha did not say gods & brahma worlds enjoy luxuries. Even their bodies are decaying & they die too. They suffer too. So what Samma Sambudhdha said was to attain nibbana & only humans are capable of that.